be completed in September 2006.
www.mobilcrane.com will follow the enterprise, and public the project, step by step. Travelling time from east to west may be redused with approximately 20 minutes, even more in the winter, when snow and ice makes the old road less passable. To download the map in high-resolution, please download from HERE! Pictures from the area where the new road will enter into the mountain. 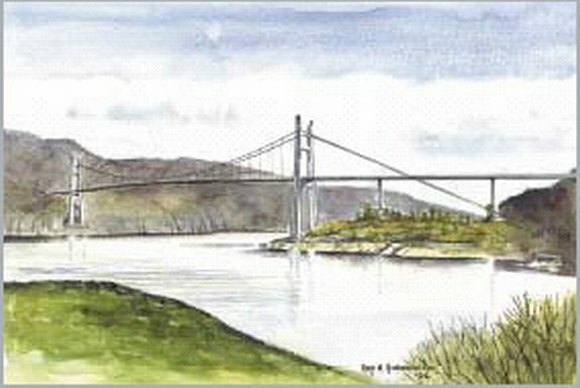 The road will pass through the mountains on both sides of the fiord, connected with the new bridge. Details from the new bridge will be available soon. The construction-site seen from east-side. The rectangle is roughly placed in the site. Source: "The World's longest Tunnel Page"
The decision-making process of which general contractor-company will get the project of building and run the new road-project, will presumably take place in February 2004. There is four multinational-enterprises participation in the tender evaluations. The deadline for handing in the tender is soon exceed, and the decision for the operating company that will execute the new road project, will be available the 13 Februar 2004. The 13 February, the "Ministry of Transport" decided to use the compamy "Veidekke ASA & Sundt AS/Allfarveg", as preferred bidder. Financial close is expected in April 2004. Further information in the attachment below. All information and pictures are ment to be used as references for Skailand Kranservice. The Liebherr 132 EC-H, tower crane from E D Knutsen Maskin AS, was rigged today, and the work to climb the crane up to 72 meters, will take place within Sunday, if the weather conditions do not change. When the bridge-tower's have reach the level of supporting the crane, stiffening girders will be mounted, and the crane will be climbed to about 130 meters ( Exact height will be entered, when available.) I myself did operate the Demag AC 120, lifting the parts in the right positions. Various telescope-combinations was used, to get the optimum capacitys, in all stages of the assembling. On the point of the "Naudenes", both the tower's are visible, and the "Peri" formwork is nearly completed. All work will take place on platforms, which will be climbed all the way to the top, 107 meter ower the sea-level. The same evening, the filling outside the mouth of the tunnel at "Speilen", did slide out, taking with some of the old road-filling. The road will probably be limited to only allow traffic in one direction at the time, controlled by traffic lights. This is a major problem, when filling rock-materials into the sea. The clay at the sea-bed, is loaded with thousands of tons, and when the liquid limit is exceeded, the clay gives way for enormous movements. The resisting moment is to blast the sea-bed with dynamite, which is done several times every day. Skailand Kranservice has now signed away the contract with "VKR-Group AS", and the contract is now in the hands of Stangeland Kran AS from Stavanger. However, there will be no big change in the execution of all crane-operations, except for the change of the supplier of mobile-cranes. I myself will operate both as Stangeland Kran's supervisor, and senior crane-operator on the project. This change will release me to concentrate even more on all commissions that will arise. The common target will be to execute all lifting-operations with maximum quality, and without any damage and/or injurys. To secure the traffic on the main road, and also establish access to the area behind the E39, a temporary culvert from ViaCon AS, was installed over the E39 at "Naudenes". To avoid traffic jam, the culvert was mounted in two parts, and transported to the construction-locality. The transport was performed by Skailand Kranservice & Osen Transport AS, and the lifting by Stangeland Kran AS. The first section ready to be transported to the rig-area. Two sections will be join together, and the total lengt when finnish, is approximately 30 meter's. by ViaCon AS, and transported to "Naudenes"
The Liebherr 132 EC-H at "Naudenes", seen from the other side of the fiord. Pictures from the transportation of the base of the tower, for the Liebherr 132 EC-H beeing assembled by E D Knutsen Maskin AS at "Teistedals-strand", on east side of "Fedafjorden Bro". Driving conditions made it necessary to use the Russian Ural 375D for this transportation, and the task was carry out without any big problem, though the stability factor was exceeded with some figures. The weight of the tower was 7,5 ton. To protect the truck from skidding on the ice, "Trygg SMT Flexi 9,5mm" snow-chains from Nøsted Kjetting AS was installed on four wheels. Although the gradient of the road down to "Teistedals-strand", some places reach up to 30%, the old Russian Ural 375D, had no problem to carry out the transportation's, in a safe and secure way. The rear-outrigger (Back-bridge) ready to be transported down to the rigg-place. The view from the cabin at Teistedalstrand, 119 meter above the sea-level. This picture is showing the sea, just after a load of dynamite have done it's job. "Fedaheia Tunnel"s exit-point from the mountain (according to plan), slight'ly marked with marking spray. Click on the picture, and view a close-up picture from the locality. www.mobilcrane.com wish the web-site www.allfarveg.no all the best, and look forward to accompany the project, all the way, until the completion date, in September 2006. The two tower at the westside of the Fedafiord, has soon reach the final height, 107 meters above the sea-level. When the tower on the westside of the "Fedafjorden Bro" is finished, the towercrane will be dismounted. All work on this tower will then be covered by the small hydraulic crane, manufactured by "Dreggen Crane AS" in Bergen. The crane had to be transported close up to the Liebherr 132 EC-H, on a rather impassable road. Again the 40 years old Ural 375D was set to work. Soon the work to stretch the cableway will start. HSM Steel Structures BV from the Netherlands, is the main contractor on the steelwork of the bridge span. A number of 9 modules, will be lifted into position, suspended in the main cables, and welded together. www.mobilcrane.com will present pictures from the work, step by step. 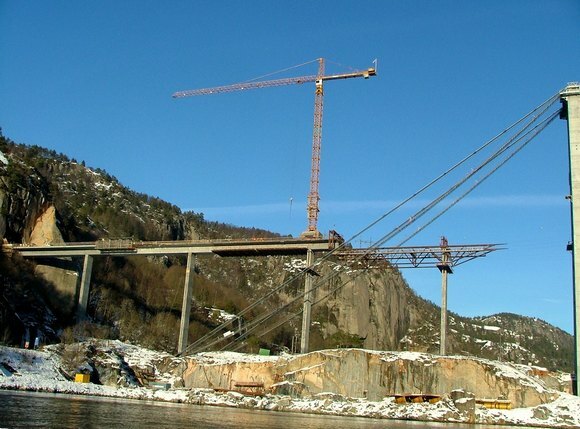 This picture is showing the Dreggen Crane, on the top of the tower of the "Fedafjorden Bro" At the other side of the fiord, the tower's are noticeable. To get a better view of the eastside, click HERE!. To assist HSM Steel Structures BV & Eltel Networks AS, in the work on "Fedafjorden Bro", a MOB-boat are now mobilized in Flekkefjord. All work on the suspension-cables, that may create any risk for other traffic, and/or the bridge-project, will be follow-up by the MOB-boat. In cases where the safety is threaten, approaching ships or boats will be warned by VHF, Light Signal & Sirene. 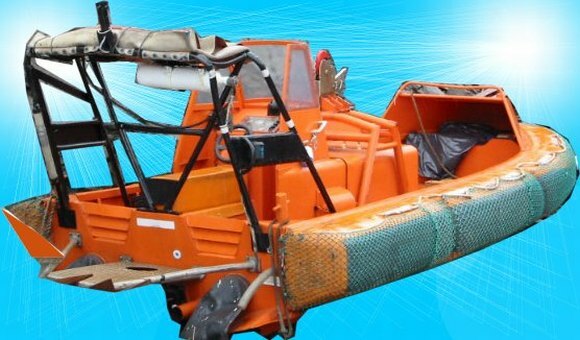 The Seabear 23 will be operative 24 hours, and may assist any wessel in distress, or any other situation, which requires for a MOB/FRC boat. Please call +47 917 93 211 for immediately assistance. For more details regarding the Seabear 23, enter HERE! This picture is from the "Fedafjorden Bro", the 11 July 2005. One wire for the "Catwalk" has been mounted, but it is very thin, and will not be noticeable in this "Long distance view". Enter HERE to see the pylon-tops cloce-up. The 10 August, the 8 main cables, each 40 ton, vere transported to the site. Since the route did go through 3 tunnel's, the main road had to be cloced for each transport. We asked the local police for assistance, and they did provide us with 2 police inspectors, that which performed the trafic-regulation. Klepp Spesialtransport AS did carry the cables, without any effort. A 120 ton crane, from Stangeland Kran AS, did load the cables, and a 200 ton crane from the same company, did unload the cables, and placed them on the site for the installation. The 14 September, the lattice girder's were lifted to the starting position for the viaduct that will bring the road to the suspension bridge. 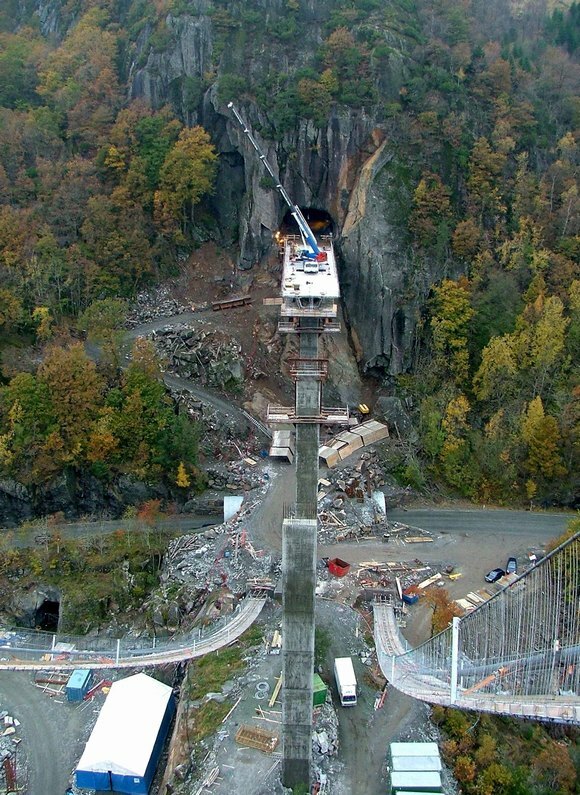 Stangeland Kran AS used their DEMAG AC 500-1 to perform the lift of the 2 girder's, each 24 ton. This road-project also include building of 6 new tunnel's, and upgrading of 3 older tunnel's. This picture is from the "Åtlands-tunnel" , on the east side of the new road. The tunnel is beeing enlarged, to allow better road safety. On the picture, a truck with a shotcrete gun, is reinforcing the rock-side. The reinforced concrete is blasted on the rock. The 1965, Ural 375D in work again. This time it's transporting a outrigger for a Liebherr 180 EC-H 10 towercrane. The outrigger will be made 5 meter longer, and then transported to the "Fedafjorden Bro" in a total length of 60 meter. This will make the mounting of the crane more easy, on the restricted area on the beginning of the viaduct. Enter HERE to see a serial of pictures of the transporting of the Liebherr towercrane. The Liebherr 186 EC-H was moved from pos.7 to pos.6 today. Since the viaduct has a little rising up towards the main bridge (1,4%), the crane had to be lifted 85mm in the rear end, and then supported on solid wood. This week the "Hanging-cables" is beeing lifted to the maim cables. To transport the 54 cables, a special "Micro-barge" has been constructed, by Skailand Kranservice. Click HERE or on the picture, to zoom to the square in the picture! If you can describe what you want to be done, we can do it! More than 20 cables were mounted in one day, with this rig. The viaduct has reached to the third colum now. The two last sections will be finish within February/Mars 2006. Today the "Uglen" did arrive Flekkefjord, to do some lifting at Simek, a shipyard nearby the town. 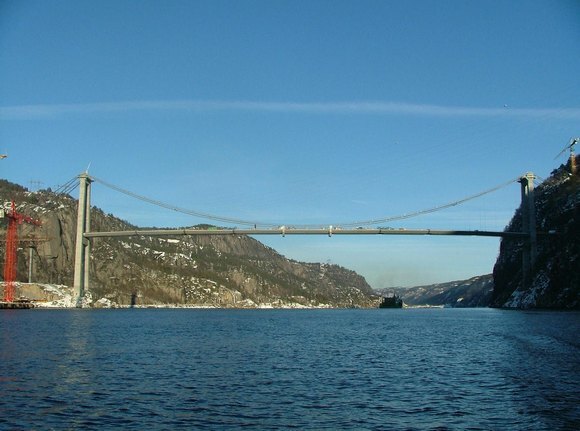 Next week, all 9 section's, constructed in Holland, by HSM Steel Structures BV, will arrive to Fedafjorden Bridge. The mounting of the sections on the main span, will start the 25 January. Allfarveg.no have set up a web-camera, that will show this work. Enter Web-Camera - "Fedafjorden Bro" to follow the work minute by minute. Skailand Kranservice will assist the mounting-team, with a securty-boat, the "FRC Rubicon"
The "Uglen" From J J Ugland Companies, with the first section of the bridge in the hook's. The "Fedafjorden Bro" is now completed. Enter HERE and see some pictures from the new road. All pictures are made by traveling from east to west (Lyngdal - Flekkefjord) There will be added some text when available. The "Fedafjorden Bro" completed with asfalt. Today the Alimak lift was removed from the tower on the westside of "Fedafjorden Bro" To reach, a 80 ton Faun with 48m bom and 9m jib was used. And we did have one of the finest day's today, ever.